MARY FEDDEN. THE PINK SHELL. 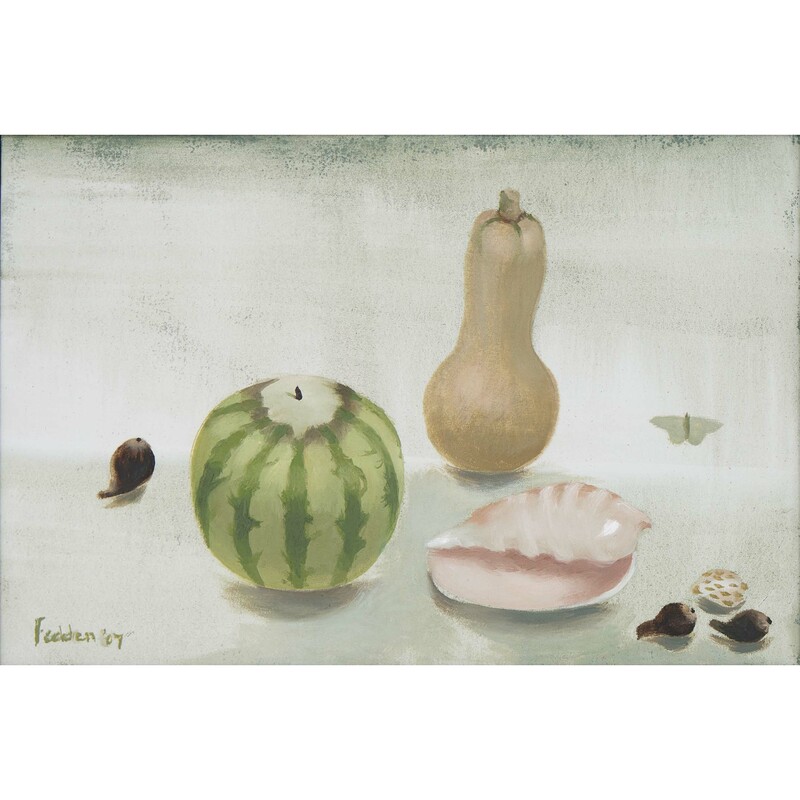 Exhibited: Mary Fedden: New Paintings, 19th June – 19 September 2007, Royal Academy of Arts, London. Catalogue no. 3. Mary Fedden had a long and distinguished association with the Royal Academy of Arts, Piccadilly, London. On 27 May 1992, less than one month short of her 80th birthday, she was elected Senior Academician of the RA. She had been exhibiting at the Summer Exhibiton every year for many years. As a Senior RA, every year she produced four paintings for the Summer Exhibiton. These works were generally some of her largest paintings and almost always sold at the exclusive private views prior to the main public opening. People would queue for many an hour in order to be first in line to race to the sales desk to secure a prized Mary Fedden painting. In 2007, Mary Fedden was honoured to be granted a one-woman show of her work in the Friends Room of the Royal Academy. 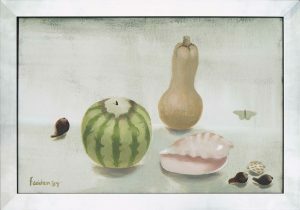 The painting offered here, The pink shell, was amongst 20 works selected for the RA exhibition. As had happened so often before, there was a very long queue on the morning the paintings became available for sale. I stood in line for a few hours but the wait was worth it. Being fairly near the front I was able to selected one of the best works on show, and came away with The pink shell. Mary Fedden attended the private view party for the Royal Academy exhibition. 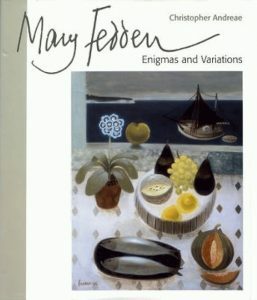 The event doubled up as the launch of Christopher Andreae’s new book Mary Fedden Enigmas and Variations. Mary and Christopher signed hundreds of books, of which 100 special copies came with a wonderful new Mary Fedden print (limited to an edition of 100). This print is shown below – I have two numbered copies of this book and print available on request. MARY FEDDEN. THE PINK SHELL. Available for sale – please contact us for further details. MARY FEDDEN. 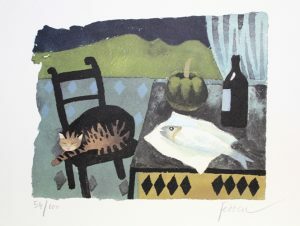 CAT AND FISH LITHOGRAPH. MARY FEDDEN. THE PINK SHELL. OIL PAINTING FOR SALE.